Over the last three decades, a number of reforms have taken place in European social policy with an impact on the opportunities for persons with disabilities to be full and active members of society. The policy reforms have aimed to change the balance between citizens’ rights and duties and the opportunities to enjoy choice and autonomy, live in the community and participate in political decision-making processes of importance for one’s life. How do the reforms influence the opportunities to exercise Active Citizenship? This volume presents the findings from the first cross-national comparison of how persons with disabilities reflexively make their way through the world, pursuing their own interests and values. The volume considers how their experiences, views and aspirations regarding participation vary across Europe. Based on retrospective life-course interviews, the volume examines the scope for agency on the part of persons with disabilities, i.e. the extent to which men and women with disabilities are able to make choices and pursue lives they have reasons to value. Drawing on structuration theory and the capability approach, the volume investigates the opportunities for exercising Active Citizenship among men and women in nine European countries. 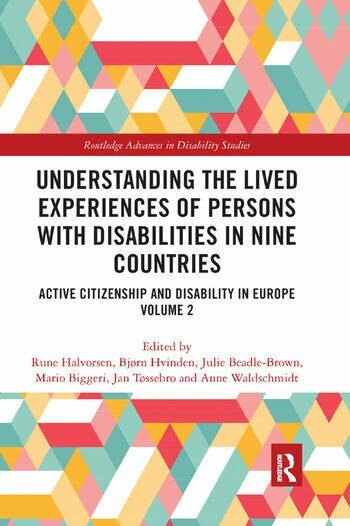 The volume identifies the policy implications of a process-oriented and multi-dimensional approach to Active Citizenship in European disability policy. It will appeal to policymakers and policy officials, as well as to researchers and students of disability studies, comparative social policy, international disability law and qualitative research methods. 8. How do Persons with Psychosocial Disabilities Experience and Practice Active Citizenship in Education and Work? Rune Halvorsen is Associate Professor in Social Policy in the Department of Social Work, Child Welfare and Social Policy, Oslo and Akershus University College, Norway. His research focuses on comparative and international social policies, social citizenship and social movements. Bjørn Hvinden is Professor in Sociology and Head of Research at Norwegian Social Research (NOVA), an institution in the Oslo and Akershus University College, Norway. His main research interests are comparative and European social policies, social citizenship, climate change and welfare, disability, poverty and youth job insecurity. Julie Beadle-Brown is Professor in Intellectual and Developmental Disabilities at the Tizard Centre, University of Kent, UK and Professor in Disability Studies at the Living with Disability Research Centre, La Trobe University, Australia. Her research, teaching and consultancy has particularly focused on deinstitutionalisation and the development of community-based services and on the implementation of person-centred approaches such as person-centred active support to improve quality of life. Mario Biggeri is Associate Professor of Development Economics at the University of Florence and Director of the Degree of Economic Development, International Social and Health Cooperation and Conflict Resolution. He is the scientific director of the research centre ARCO – Action Research for CO-Development – and Fellow of the Human Development and Capability Association. He is the author and coauthor of 12 books and he has published several articles on disability in international journals. Jan Tøssebro is Professor of Social Work and Director of NTNU Social Research, Trondheim, Norway. His primary research interests are disability policy, notably deinstitutionalisation, inclusive education, families with disabled children, standards of living and working life experience.